The Smith & Wesson M&P15-22 is one of my favorite guns to shoot. I have a few thousand rounds through mine and it continues to perform extremely well. Is it 100% reliable? No – but I know of no rimfire that is. I’ll tell you what – it is extremely close – maybe 99.8%. The factory capacity magazine hold 25 .22LR rounds and much like the rifle has an appearance that lends itself much to the AR/M4 appearance. Like any other red-blooded American male (and quite a few females out there) – higher capacity is welcomed when it comes to firearms. Looking around at my local Academy Sports store I saw the ProMag S&W M&P15-22 32 round magazine. 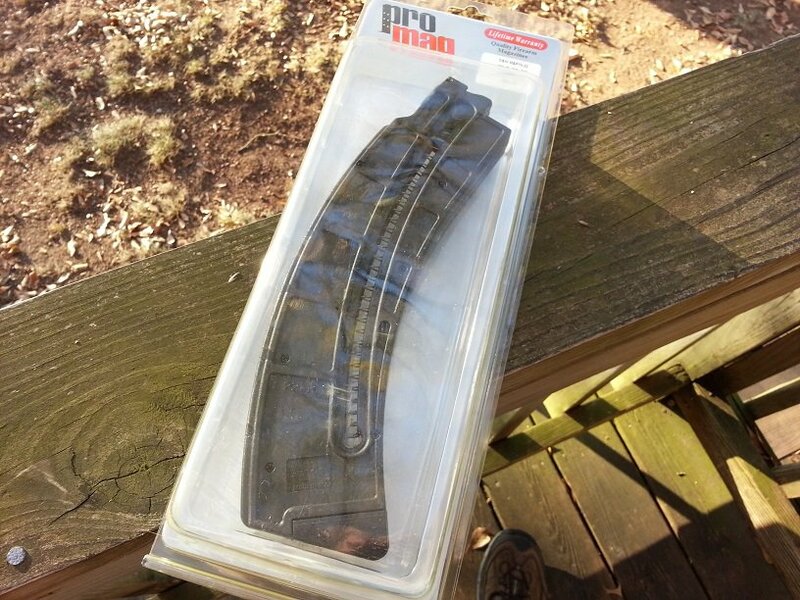 I have never had any ProMag products before as from what I have read online their reputation is not the best. Looking at the magazine in the store it looked to be of good quality and build. In fact – it looked to be a VERY close clone of the factory magazine other than being a bit longer. At a price for $14.99 – I couldn’t pass it up and bought one. Over Thanksgiving I spent some time at my bug out location in Georgia and was able to test the ProMag magazine. As stated already – placing the factory magazine and the ProMag next to each other they look very similar. I actually mentioned to my brother that I would not be surprised if they were made in the same factory on the same equipment with minor cosmetic changes. Likely they are not – but the point is they are very similar. The ProMag M&P15-22 32 round magazine looks to be well made. I work in a polymer manufacturing facility – and reviewing the magazine for any molding issues – it looked very good. Lines are clean, seams are tight – no issues. Inserting the magazine into my M&P15-22 it fit securely with no excess wiggle or wobble. Again, very similar to the factory magazine. The obvious purpose of any magazine is to supply ammunition to the firing mechanism. The ProMag 32 rounder does just that at a capacity that is 7 rounds of .22LR higher than the standard factory magazine. This should be done with durably and reliably. I loaded and shot right around 300 rounds through the single ProMag 32-round magazine I bought. Reliability was excellent. The only issues I had occurred on the very first, initial 32 rounds. In fact – I had 3 failures for the bolt to move forward on the first 6 shots fired. After that – flawless. I believe that the cause of those failures involved the magazine lips slightly rubbing up against the bolt on initial shots, thus slowing the bolt down. After just a few shots the feed lips were “broken in” and there were no more issues. I am very pleased with the ProMag’s performance. Shooting the M&P15-22 with the 32 round magazine felt no different than the standard 25 round factory magazine. Yes – it is longer but the feel of the gun really changed little. Obviously shooting prone, walking through brush, navigating any type of tight spaces could prove a bit troublesome with the longer magazine. What I have found thus far – at least with this single example – is a cheaper alternative to the standard factory magazine at a higher capacity. At a cost of $14.99 – I went ahead and purchased another to go with my 6 factory magazines. If you cannot find one at your local sporting goods store or gun shop – MidwayUSA.com has them and currently on sale for $12.99. Great info Rourke. Since I’ve got a Smith I’ll buy a couple. Thanks brother! I’d like to post a link to this review sometime this week if you’re good with that. Good review! Thanks for the write up. I bought several Promag magazines for my Ruger Mini-14. I have not tried them out yet. If they have a break in period, I guess I should find out before any threats are “in the wire”. I purchase all my magazines from MidwayUSA. They are the cheapest, most reliable source that I’ve found. 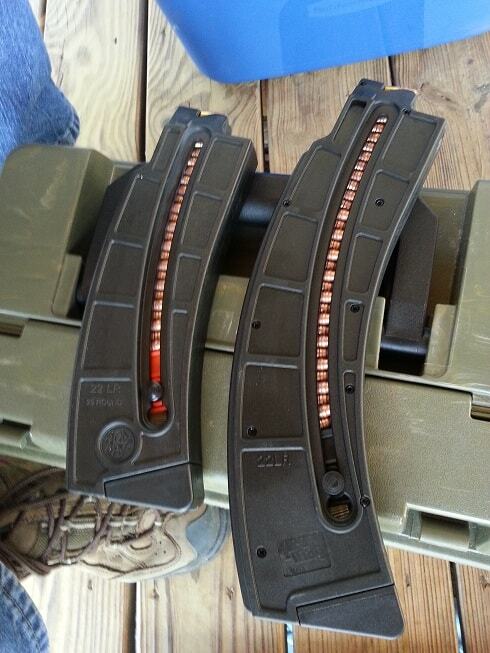 I read an article online the other day where the author refused to use the term “high capacity” magazines. He insisted that 20 and 30 round mags were actually standard capacity, since that is what the weapon was designed to shoot. He said that the term “high capacity” was made up by the government to scare folks into supporting more gun control. Yeah – I know all about the term “high capacity”. Every time I use it to differentiate between a 10, 15, or even 20 to a 30 round magazine readers chew me up. Test your ProMags’s out and if they don’t fire good send them back to Midway. Why would you spend so much money on a 22 ? Not to be smart – but because I want to. 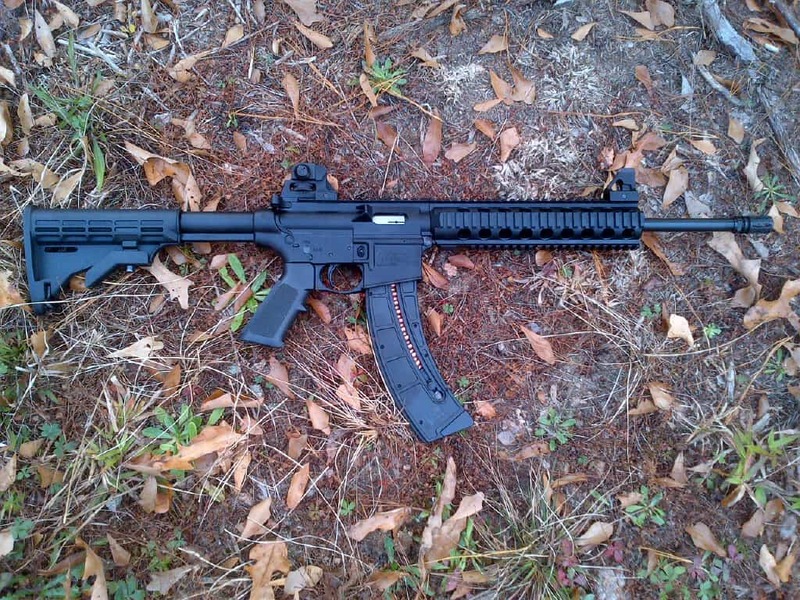 Seriously – it is a great trainer for the AR and much cheaper to shoot. I love .22’s and found it worth the money at the time. Love my three Ruger 10/22’s as well. In the USA we solved this problem in 1776 – a few determined and armed citizens stood up for their rights and threw off the yoke of Imperialism. I am certain we have a few decent books sitting around that could give you some pointers on how to join us in our noble political experiment. In Part 2 of the New Zealand Bill of Rights Act of 1990 (in force by Royal Consent), specifically Chapters 21 and 22, you are granted by the power of government (as oppossed to our rights which are considered God given inaliable rights) the right to freedom from “unreasonable search and siezure” and the right of “liberty of person”. Both of these date back to English Common Law (c. 1189, though there are earlier judicial precedents on record that may apply). History and NZ Civics lesson aside, how does the citizenry of New Zealand maintain these rights in the face of government oppression without the right to bear arms in their defense? Quis custodiet ipsos custodes?